Providing you the best range of plastic granulator blades and plastic granulator blades with effective & timely delivery. • Size: As per the drawing. • Hardness as per Drawing. Excellent quality , Tolrences in microns . Manufactured from Imported Raw Material. 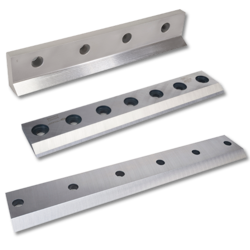 We have established ourselves as a leading name of Plastic Granulator Blades in the market at present. This product from our end is a tool with an edge free from curves, or straight, used for cutting and peeling. These are provided as per the set industry norms and guidelines. We make these products available to the customer at industry leading rates.